Gallaber Farm is a working beef and sheep farm located on the outskirts of the picturesque village of Burton-in-Lonsdale, set in the beautiful countryside on the borders of North Yorkshire, Lancashire and Cumbria. The farm is home to a pedigree herd of Limousin cattle and also a flock of approx 500 breeding ewes. Gallaber Farm offers a small, well kept caravan park. With 15 pitches for touring caravans and two static caravans. The park is surrounded by beautiful countryside and offers stunning views, including the farm's livestock. The latest addition to the farm is a luxury barn conversion, holiday cottage. Offering truly outstanding panoramic views of the surrounding dales! The cottage offers accommodation for 4 people. 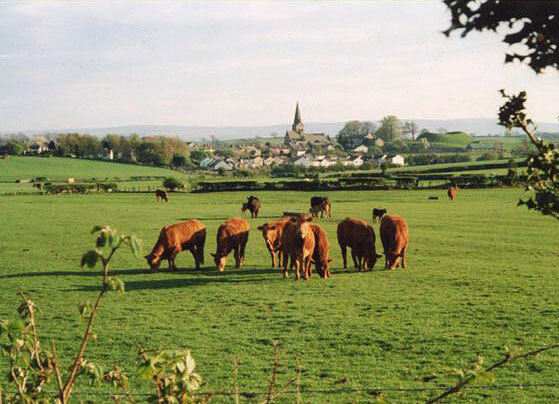 At the heart of Gallaber farm is our herd of 50 pedigree Limousin cows, which was established in 1989. We pride ourselves on breeding well muscled cattle with calm temperament. We aim to breed top quality cattle in a natural environment. Gallaber Lamb is now available fresh from the farm gate. See the Fresh Pastures website for more details.